Listening is an art form. At no time is this more important than when a friend or colleague is experiencing grief. Let him or her talk about how they are feeling and let them talk about the person who has died. Don't try to fix it, because you can't. According to Liz Aleshire, author of 101 Ways You Can Help, the grieving family has an "almost physical need to talk about what happened to her family, to share memories, to rehash the wake and funeral." Every time they speak about their family member, it's one step towards the healing process. Let them lead the conversation. You can add a comment here and there, in agreement, to keep the conversation going. Don't try to change the subject, or bring up other people's experiences. It depends on your closeness to the honoree. If you are an acquaintance or casual friend, you needn't say more than "I'm so sorry" or "He was a wonderful person." Closer friends can be more personal, saying "We're going to miss Josette very much." Do not ask about the details of the death. If a family member does mention their last days, try to comfort them. 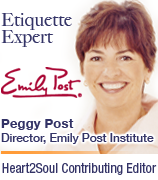 Peggy Post, director and spokesperson for The Emily Post® Institute, suggests you call on the grieving family and try not to avoid them. Everyone grieves in their own way and while some may want to be alone for a while, others may need you to be there and listen - take your cues from your friend or family member. Don't be surprised if you feel tense or anxious before you talk to the grieving family members. It's common (and that's why we're here to help). "I'm so sorry about your loss." "I know what you're going through." Every griever's experience is different. No one can say they know what someone is feeling. "Let me make you dinner tonight." "Call me if you need anything." "Please know that I am thinking of you." "Time heals all wounds." "She was a great person." "She's in a better place now." had (insert personal memory of honoree here.)" "At least he's not suffering anymore." Remember not to monopolize the mourner's time. They need time to meet with others and time alone.